According to the U.S. Census Bureau, nearly one in five people in the U.S. have a disability. That’s about 56.7 million people—more than half of whom classify their disability as “severe.” For the most part, this large population has been excluded from the recreational pursuits that able-bodied folks take for granted. But in the adventure park business, that is changing, as these reports from our online Park 360 (adventureparkinsider.com) show. 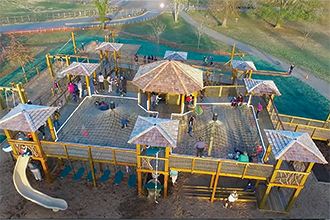 Several drones captured the soft opening of Everyone’s Beanstalk Playground and its accessible features last January. Everybody’s Playground: Mike Fischesser, owner of Beanstalk Builders, is passionate about accessibility. A few years back, he convened a group of accessibility experts to design a truly accessible playground. The results came to fruition in January, when the “Everyone’s Beanstalk Playground” opened at Catawba Meadows, N.C. The playground is filled with rope events, slides, tree houses, and other typical playground-type elements. 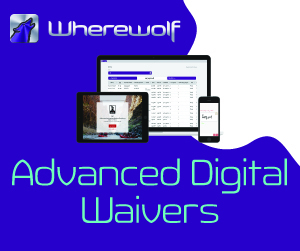 At least a dozen of the 40 elements are universally accessible, including a wheelchair swing that allows users to ride without exiting their chairs. Ramps allow wheelchair access to a central platform that is eight feet off the ground. The playground’s design is also welcoming to the hearing and visually impaired, as well as kids with autism and Asberger’s. Fischesser says the new playground has received a lot of interest, and Beanstalk has already devised three different sizes/versions of it for prospective clients. Accessible Zips: Accessible access is not legally required for most zip lines, because zip lines were not specifically addressed when standards were being developed for amusement rides in the early 2000s. And since zip lines lack a conventional seat, many operators are granted an ADA waiver due to the nature of the activity. But some zip line operators have created some clever solutions for accessibility nonetheless. Here are three examples. Camp Twin Lakes: Camp Twin Lakes in Rutledge, Ga., provides weeklong camps for kids with serious illnesses, disabilities, and other challenges. It teaches campers to overcome obstacles and boost their confidence. The camp worked with Signature Research, Inc., to develop a ropes course, zip lines, climbing wall, and a giant swing, which are all accessible. “We want to be able to help every child adapt to the setting and be able to accomplish those challenges,” says Josh Cagliani, senior camp coordinator. The climbing wall has three climbing routes and an open back equipped with a stairwell to the top platform. Campers can reach the top of the wall using ascenders and other tools, or climb the stairs to the top platform and ride a 600-foot zip line over a lake. Campers unable to make the climb are assisted to the top platform using a 4:1-pulley system. They are hooked in from the ground and raised to the platform, where staff members assist with the transfer onto the zip cable. The zip lines at CTL Rutledge are set up on a hydraulic system that gives CTL staff the ability to lower campers to the ground or directly into their wheelchairs. At CTL Will-O-Way, another CTL campsite in Winder, Ga., campers can be hooked in from the landing point and be reverse-hauled to the starting platform. They can then either release themselves or have a CTL staff member release them down the cable. Treetop Trekking devised this accessible zip line for the 2015 Pan Am Games in Toronto, then adapted the concept for the new Skywood Discovery Zip Line in the 1000 Islands. Treetop Trekking: The 2015 Pan Am and Para Pan Am Games in Toronto featured a temporary, accessible zip line installation. Treetop Trekking designed the zip to meet the Accessibility for Ontarians with Disabilities Act (AODA) standards. Inspired by the zip line’s popularity, Treetop Trekking included an accessible zip line at one of its newest projects: Skywood Eco Adventure Park in the 1000 Islands of Ontario. The Pan Am zip line featured two 400-foot-long cables strung between scaffolding towers. Zippers needed the capacity to transfer themselves into a reclining chair, where they were secured into a sit harness that featured a special brace to provide stability and eliminate the need to steer. 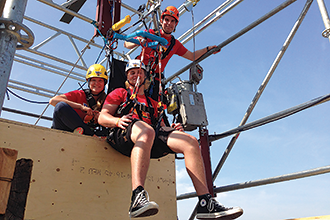 Once the rider was secured in the harness, Treetop Trekking staff used an electric hoist and pulley system to raise participants up the 60- foot launch tower. Riders were then transferred to the zip cable and sent flying over the Toronto waterfront to the opposite tower. There, a second hoist system lowered riders back to the ground. Skywood’s Discovery Zip Line is a standalone zip built 10 feet off the ground and designed for people with reduced mobility, or people who require mobility aids. Gatorland’s Gator Gauntlet: After three years of testing prototypes, the accessible Gator Gauntlet opened in 2016. The 350-foot zip line soars over a breeding marsh that’s home to 130 alligators. Riders must have enough strength and mobility to transfer into the harnessing chair, or have a caregiver assist. As with Treetop Trekking’s sit harness, a spacer bar provides added stability. An accessible ramp leads to the launch deck, where riders are attached to a chain hoist that raises them out of the wheelchair. Staff members transfer the rider to the zip cable and, using a quick-release carabiner, send them zipping over the marsh to the landing platform on the other side, where a chain hoist lowers them into a waiting wheelchair. These varied experiences show that accessible zips (and ropes courses as well) can make sense for select operators. As one CTL Rutledge camper said, “I may not be able to walk, but I can fly.” Not many other businesses can bestow such a gift.